Thank you for the info. I will see I can roll carefully and get a glimpse of all the stops. And post some pics. Originals were printed with D 6TH AVE-HOUSTON, F 6TH AVE-HOUSTON, and E 8TH-AVE HOUSTON in anticipation of the Houston service. 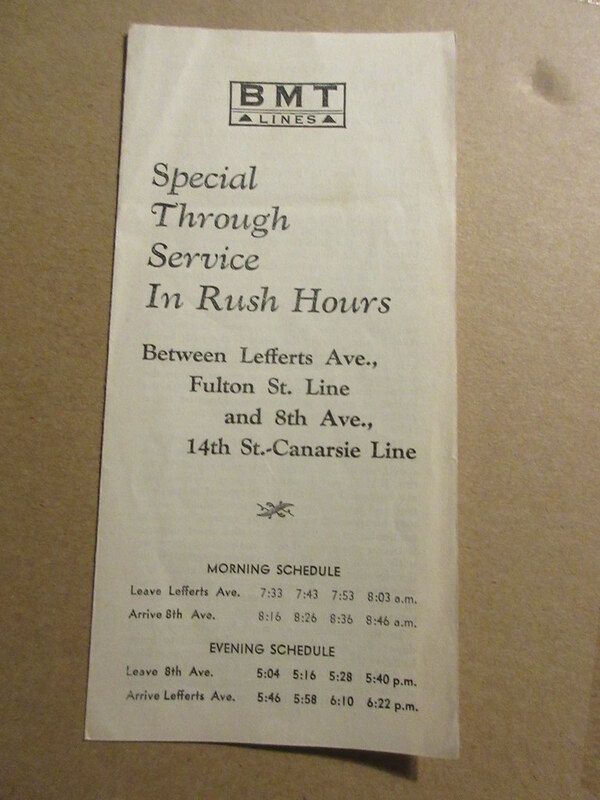 Some of the D and F rolls survived (makes sense for the 2nd Ave service) but almost none of the E rolls remained. I've seen an E 8TH AVE-HOUSTON survive once, ever, and only on a side curtain, never on a front curtain. Here is where it got a bit dicey. The paper was starting to get taught and show signs of ripping and I did not want to go on. It looked like it said CC Local. There were 1 or 2 more past this but did not get to it. Is this what you meant by Rare Readings? Hi, im new to this forum. Not sure what's allowed or not. 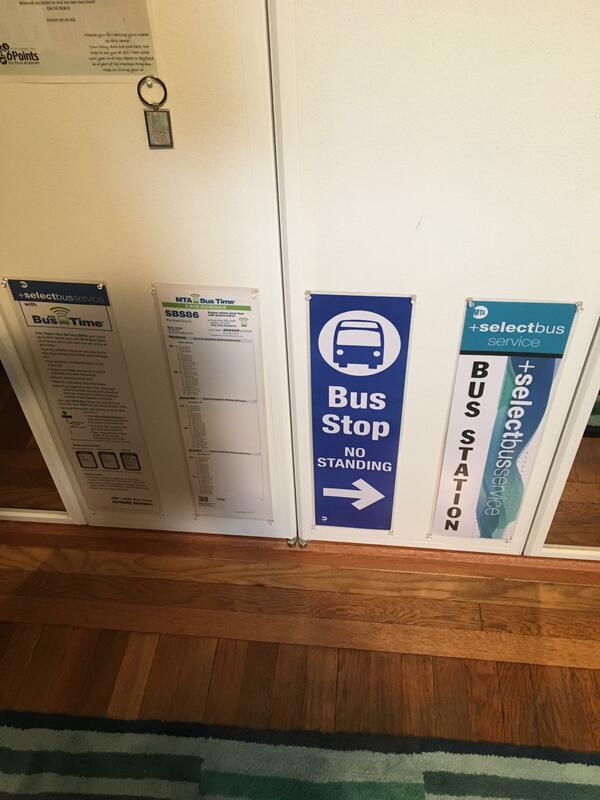 I have a very large transit collection in my possession . Many thousands of subway maps, roll ups, historic bridge openings, bus trolley, MTA, Septa etc Probably one of the largest collections on the planet. Located in NYC. Is it possible that someone here knows where I would be able to sell it as a whole? Not bit by bit on ebay. For now I have one copy of Uptown Downtown A Trip Through Time On New York's Subways. One copy of The WPA Guide To 1930's New York City. I have both of those. 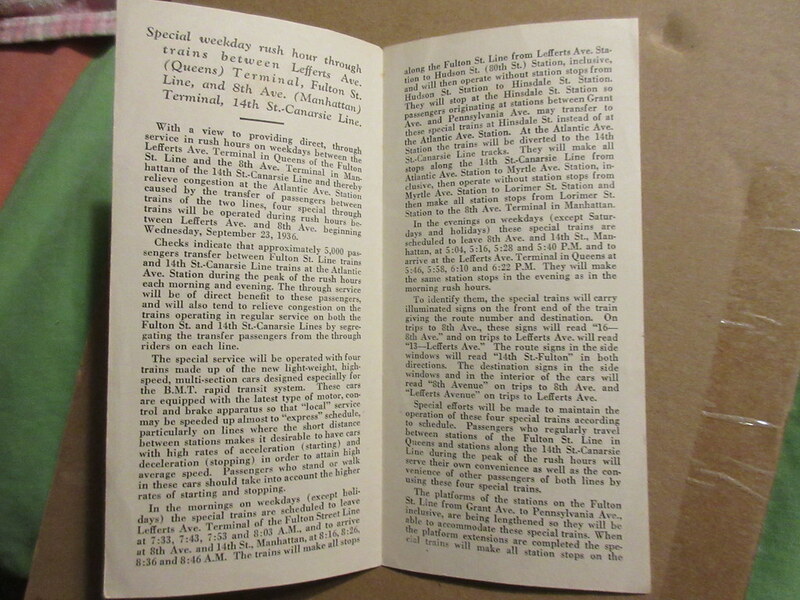 I have just purchased a copy of New York City Guide by Federal Writers Project from 1939. The book contains the map of Manhattan and the subway and elevated lines of 1939 in the back pocket. The book seller describes the book as being in Very Good condition and the map as being in Pristine condition for a book and map from 1939. The only thing that is missing is the dust jacket but that is ok. My copy is a first edition. I am waiting on confirmation from Westside Bookshop in Ann Arbor, Michigan. Book seller Westside Book Shop of Ann Arbor, Michigan has confirmed my order and has shipped my book and map to me. I think it is a great find. 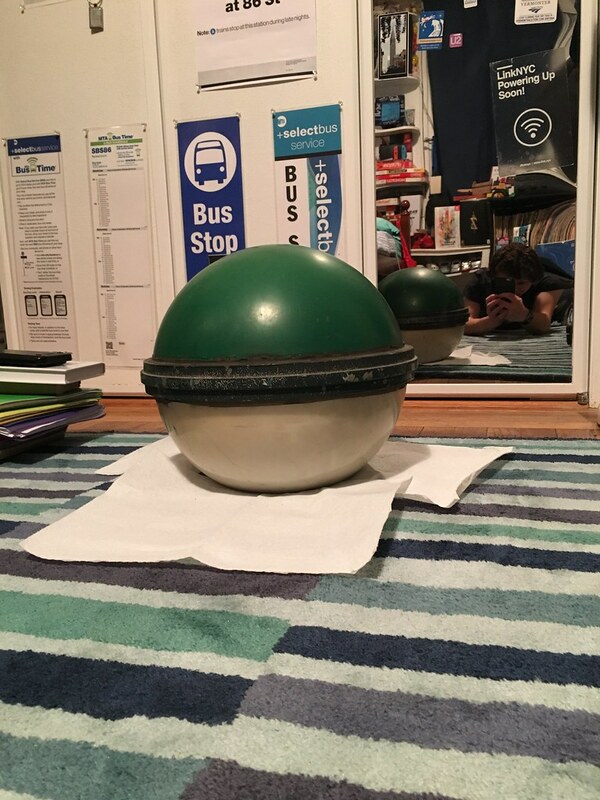 Here is an entrance globe that my dad was able to get for me the day of the reopening of 86th Street after its ESI rebuild. 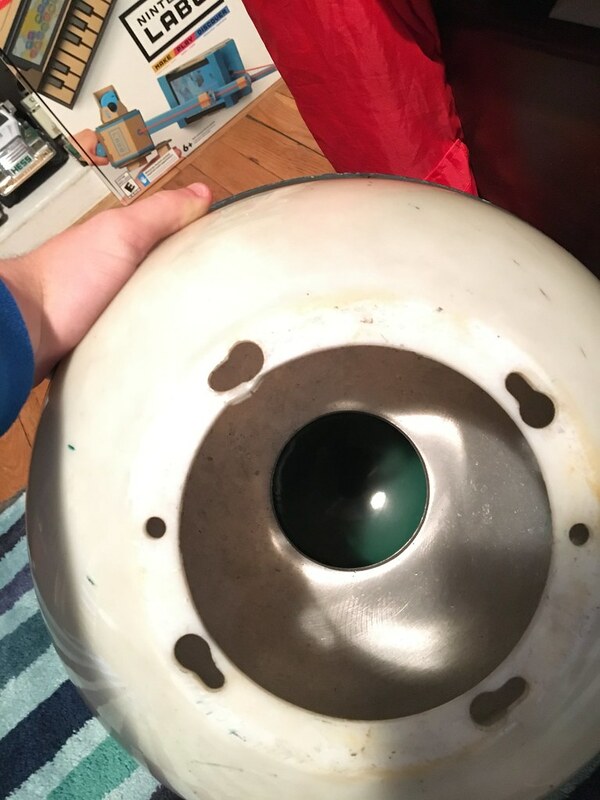 I'd love to turn it into a lamp or something, but the metal divider which internally divides the green and white sections make it difficult to know what light may fit inside that would light up both halves well. My copy of New York City Guide by Federal Writers Project with Manhattan/Subway and Elevated Map is expected to be delivered Friday February 15th. My book went from Ann Arbor, Michigan to Pittsburgh, Pennsylvania but is now on the way to Tucson, Arizona. Book seller Westside Book Shop describes the book as having a tight, square binding for a book from 1939. The map is described as pristine. Sounds like it was well taken care of over time. 2019 is the eightieth anniversary for the New York City Guide by Federal Writers Project of The Works Project Administration. My book and map might arrive tomorrow of this week or Tuesday of next week. Looking forward to opening the package when it does arrive. 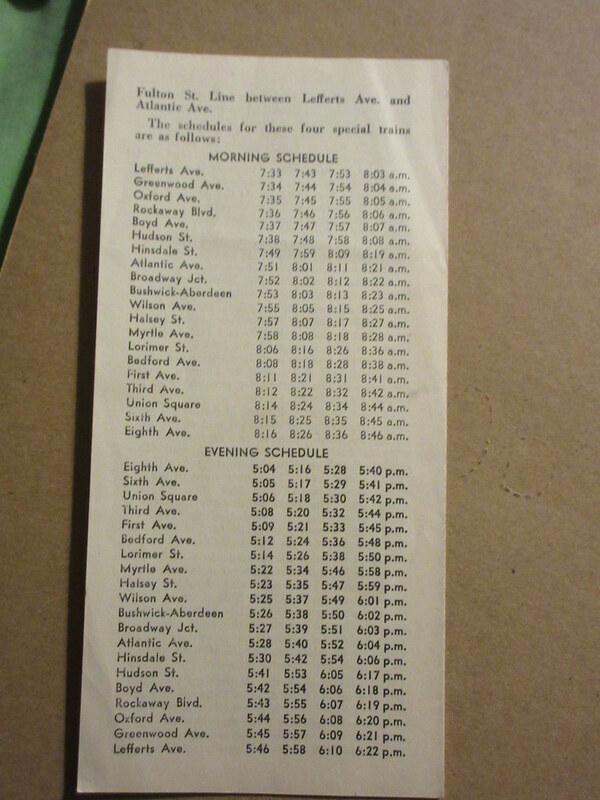 It has both the 1964 subway maps in color and the 1964 subway time maps. Each of the four boroughs is shown with its subway lines - blue for the I.R.T., yellow for the B.M.T. and red for the IND.. There is also a map of the Port Authority Trans Hudson. 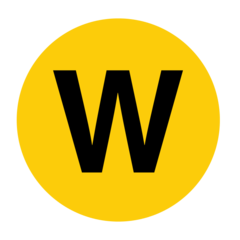 Both Subways and Port Authority Trans Hudson have entries as do Buses. My copy of New York City Guide with Manhattan and Subway and Elevated Map has arrived in Arizona. My book arrived in Phoenix on February 17th. I am sure it will be delivered to me on Tuesday February 19th. The book is described as being in very good++ condition and the map as being in pristine condition. I am looking forward to reading the original book from 1939. My 1939 subway and elevated map with Manhattan map did arrive today as part of the New York City Guide A Comprehensive Guide To The Five Boroughs Of The Metropolis - Manhattan, The Bronx, Brooklyn, Queens And Richmond. It is a beautiful map. Federal Writers' Project W.P.A. New York City. The Street Map Of Manhattan has the subway and elevated lines superimposed on their streets. Both the subway and elevated lines map and the Manhattan map show the Sixth Avenue IND. then under construction. I carefully unfolded my map this morning. @Engineer Thanks, that picture confirms what you said as well as my description of what I assumed you were talking about. In hindsight, I should have worded my response better - I feel a bit silly asking you to confirm something you can clearly see with the globe right in front of you, so I apologize if you might have taken any offense from that. Regarding the lighting, if you plan to use it in your room, your typical residential light bulb is probably sufficient. Just make sure it fits through the hole and that the bulb is omnidirectional. But if you're interested in the bulb that NYCT used, I can tell you that they are using either a high pressure sodium (HPS) or metal halide (MH) lamp; the drawing shows an outline that indicates they use that kind of lamp, and the LED bulb they use has specified that it is meant for replacement of those aforementioned lamps. MH lamps can go as low as 3000K (which is a warm white color that is a bit whiter than the capsule CFLs used to light up the subway tunnels), and HPS lamps are really warm to the point where they look orange-ish (street lamps used the same thing before NYCDOT changed to LED). The diameter of that divider is going to be the determining factor in what bulb you can use; a quick look online gave me a 2.125 inch diameter for HPS lamps and 2.5 for CFLs, so see what works for you. a quick look online gave me a 2.125 inch diameter for HPS lamps and 2.5 for CFLs, so see what works for you. Thanks! The biggest issue for me likely would be finding a place in my room to put the lamp, or figure out some sort of mount to place it on. I'll definitely post here if I can get a bulb inside and have it lit up well, as I'm sure it'd be really cool to have it look like a nice authentic entrance lamp. Just wondering, I assume if I did want to use a bulb that they would use that it'd be easy to run it off of standard household current? I should really take the time to photograph my vast collection and post some pictures here. I took these just now for this thread on subchat. It says "Obtain a Posting Password". Subchat is still alive and doing well. 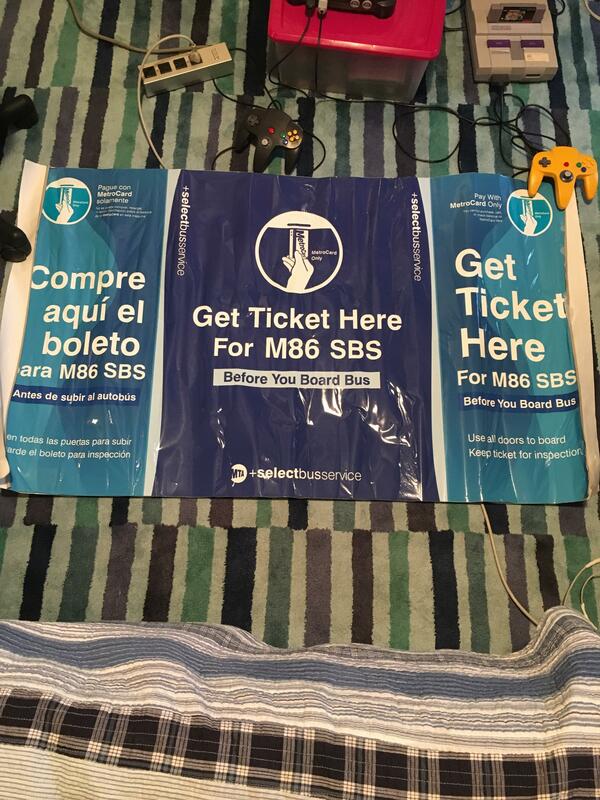 My dad got these for me when the M86 was being converted to an SBS route. The adhesive has done some damage to the machine wrap but it's still a neat item to have, I think. Please note that I am willing to exchange some of my memorabilia for other memorabilia. Please send me a private message for more information. I am a current employee with MTA track dept. is that a TRACK helmet? If so i would like to trade you something off interest for it.